A smart, practical foreign policy on North Korea would be devoid of the ideological baggage that usually accompanies strategic decision-making. The risks involved with initiating a conflict with Kim Jong Un are too great to simply frame the North Korean problem in ideological terms. If Kim Jong Un decided to attack Seoul, which is only thirty miles from the North Korean border, the loss of life would measure in the hundreds of thousands and perhaps even the millions. A more nuanced approach toward North Korea emerges only when one views North Korea as a sub-system nested within a more complex and interdependent international system. Our main argument is that a smart, practical foreign policy on North Korea must include cooperation with China, a controlled Russia, strong assurances to South Korea, the equities of Japan, robust domestic support in the United States and no direct military confrontation to achieve the political objective of a denuclearized Korean peninsula. Russia remains a wild card in our projections. The key assumption for all of our scenarios is that Russia will at least remain neutral in response to any attempt at regime evolution in North Korea. Russia will likely need to be placated in some way, either by the United States, or China, or both. A further easing of economic pressure on the Putin regime or outright economic incentives may be one path toward Russian neutrality. If Russia is not neutralized, the possibility of Russia acting as a spoiler in North Korea remains high. Russia has shown this tendency even toward China. China recently cut off North Korea’s supply of aviation fuel and Russia stepped quickly into the breach; it is now the sole provider of aviation fuel to North Korea. The importance of a neutral Russia cannot be overstated. We use the Schwartz model to produce four scenarios of the near future and examine the two most strategically beneficial and the most strategically devastating scenarios in detail below. The purpose of the Schwartz model is to forecast the future using two key uncertainties in the operational environment that are most important for developing possible future scenarios that can be used to formulate strategy. The two main variables driving our scenarios are the amount of diplomatic and economic pressure placed on the Kim Jong Un regime and the degree of military intervention conducted by the US and its allies/partners. Amount of pressure and military intervention are most pertinent uncertainties driving potential future conflict. These two variables allow us to explore the possible benefits of foreign policy intervention and the risks involved with each course of action. The table below shows a rough outline of the four future scenarios the Schwartz model analysis produced. The Schwartz model produced one status quo scenario, one extreme scenario of pre-emptive/preventative strike and war, and two scenarios in which pragmatic foreign policies lead to cooperative strategies short of war. The status quo is the least interesting scenario and the one most readers should be familiar with. We will spend very little time on this scenario other than to note that the status quo carries risk as well. Inaction and business as usual often lull decision-makers into a false sense of security as unforeseen crises may loom over the horizon. As a case in point, see the perceived inaction associated with the so-called Obama Red Line and the resultant increased violence. Allowing Kim Jong Un to perfect his nuclear capability, especially integrating intercontinental ballistic missile (ICBM) technology, only heightens the chance of a nuclear strike on the United States, South Korea, or Japan. We wish to make clear here that the status quo is no longer an acceptable strategy from a risk perspective based on the continued development of the North Korean offensive nuclear capability. The next scenario we wish to examine we call soft power regime evolution, in which there is low military intervention and high diplomatic and economic pressure are applied to the Kim Jong Un regime. This scenario requires a great deal of Chinese cooperation, as the Chinese would have to drastically shift from their current stance of propping up the regime to a strategy of stressing the North Korean economy. In particular, Chinese imports of oil and gas to North Korea are a key point of economic leverage that could be used to influence the leadership of North Korea, far beyond what they have already done in cutting off jet fuel imports. The United States would continue to enhance the multilateral nature of sanctions against North Korea and, with China, increase rhetoric that it is unhappy with the Kim Jong Un regime. A key risk is that all of the North Korean elites may feel under siege and isolated. Therefore, the United States and China must signal to the elites in North Korea that support Kim Jong Un that he is the problem, not the entire administration. Admiral Harry Harris, commander of the US Pacific Command, has utilized such rhetoric with his announcement that the United States seeks to bring Kim Jong Un to his senses, not to his knees. In fact, in this scenario, Kim Jong Un could defuse the situation by refraining from testing nuclear weapons and ICBMs and begin in earnest to dismantle the North Korean nuclear program. With proper messaging, another avenue for regime evolution may occur in which Kim Jong Un remains recalcitrant and other elites might become fed up with the pressure of comprehensive economic sanctions or other, non-military actions taken by the US, China, and other stakeholders. In this variation on peaceful evolution, elites in North Korea might arrest and replace Kim Jong Un with a new regime more cooperative with international norms and regional agreements. Because Kim Jong Un is not assassinated, there is less risk of internal instability, but because of the mythos developed around the “great leader,” this cannot be completely ruled out. The US and others should ensure this is not be misinterpreted as external regime change but an internal shift beneficial to the region, because actors in the region are either lukewarm over the prospect or actively opposed to it. The South Korean government is worried that rapid regime change will lead to a refugee crisis and perhaps even a call for quick reunification which would bankrupt their economy. Similarly, China has suffered a slow refugee crisis across its borders and is loath to see this trickle turn into a torrent. More strategically pressing to China is a buffer zone between mainland China and the vibrant democracy in South Korea. Chinese president Xi Jingping has said recently that it would tolerate no US troops north of the 38th parallel, indicating how pressing the North Korean buffer zone is to the Chinese administration. If there is any internal chaos because of regime evolution, the Chinese would have to take the lead in stability operations. At first glance this seems untenable given the animosity between China, Taiwan, South Korea, Japan, and even the United States. However, South Korea and Japan have been sharing intelligence for over a year now and both nations are reliant on trade with China. The United States has recently had some very positive engagements with China indicating that relations may be improving between the two nations. One positive side effect of a chaotic Kim Jong Un regime is that it has brought historical enemies into closer cooperation. This scenario emphasizes less economic and diplomatic pressure, but increased military pressure. In this case, the military pressure is very specific and aimed at fomenting a military coup within North Korea. Again, collusion between the major players remains necessary to success. The key assumption in this scenario is that China has been developing a backup plan to Kim Jong Un. Since Kim Jong Un has become so unstable and does not follow Chinese directives, it is reasonable to assume China is grooming a successor in the North Korean military elite. In this case, it is necessary that China have buy-in from the United States and South Korea and, to a lesser extent, Japan, and Taiwan. 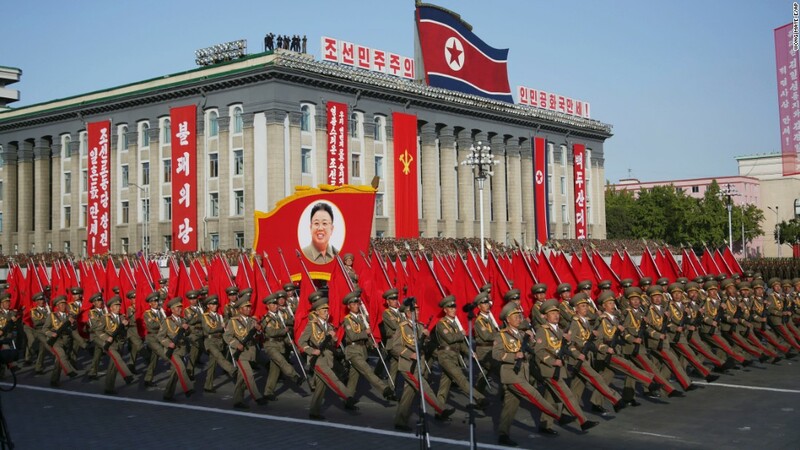 A sudden military coup the United States and South Korea are not expecting could have disastrous results, as both nations would likely feel compelled to cross the 38th parallel to secure artillery, ICBM, nuclear, and chemical sites and mitigate potential threats to Seoul. Without prior coordination, such a move could frighten the American and South Korean governments into overreacting and anxious Chinese, American, South, and North Korean troops could find themselves in a very tense standoff, if not actual combat. Again, the key to any successful strategy involves cooperation with China. There are more risks with this scenario. Any miscalculation of support from the military could result in a civil war in North Korea which would lead to loss of positive control over existing nuclear stockpiles. Likewise, there is a high likelihood of an exodus of North Korean refugees into China, Russia, and South Korea that would make the Syrian refugee crisis pale in comparison. A pre-emptive or preventative strike against the North Korean regime should be a last resort, as the risk that such a strike brings is very great. While the United States possesses significant strike capability, such as B-2 bombers from Whiteman Air Force Base in Missouri and naval launched cruise missiles currently stationed off the Korean peninsula, even the complete destruction of Kim Jong Un’s nuclear capability—which would be extremely improbable—leaves him with considerable military power. Likely this would force Kim Jong Un into a pariah status along the lines of Saddam Hussein or Mohmar Khadaffi. With advanced artillery, hardened with bunkers and caves and located within just miles of Seoul, there is no way to prevent artillery strikes on the South Korean capital. Hundreds of thousands, perhaps millions, of civilians would die in the course of the shelling. It is hard to imagine a restrained South Korea after such an attack. South Korean and likely US forces would march toward Pyongyang and China would also cross the Yalu. North Korea recently warned China of grave consequences if they continue to support stricter sanctions and continue to threaten military intervention. Defections may occur, but a full-scale war is the most likely outcome. Assuming an end to the conflict, a negotiation process will have to occur. Regime evolution would seem unlikely at this point and the United States would likely to default to regime change and become embroiled in an expensive quagmire of nation-building a very backward and separate North Korea, assuming a lack of reunification. If the United States is in the lead, a democratization process will likely be attempted. The Chinese will see this democratization process as threatening and, if allowed to occur in the first place, the Chinese will likely seek ways to undermine it. The South Koreans may be less than supportive if the United States tries to punt on nation-building and attempt to sell reunification. The South Koreans, as we have argued above, have run the numbers and simply cannot absorb the estimated 7% GDP hit for a decade that is projected should the two Koreas reunify. Even if the United States were to promise to help rebuild North Korea but the possibility of a renege remains, reunification is likely to remain a non-starter with the South Korean government. This is a worst case scenario and should be avoided. A smart, pragmatic foreign policy to deter North Korea and achieve the objective of a denuclearized Korean peninsula starts with cooperation by China, a neutral Russia, robust domestic support in the United States, and no direct military intervention. With cooperation of the Chinese and neutrality of the Russians, this effectively isolates North Korea and provides the United States with an expanded degree of freedom within which to act diplomatically or militarily. But this does nothing to stop a North Korean military strike which is why we believe regime evolution rather than military conflict and forced regime change is preferable. Likewise, including Japanese naval forces in the deterrence and defense against ballistic missiles sends a strong signal of regional unity without inflaming historic tensions between Japan and South Korea which would more likely be induced if Japan tried to use ground or air forces. Furthermore, it is paramount that the administration clearly articulates the United States strategic aims, political objectives, and achievable military objectives prior to initiating any military action. We clearly understand the significant implications of a military conflict on the Korean peninsula and above we have outlined some military intervention regime evolution alternatives that carry less strategic risk. To echo recent statements by Admiral Harris, the best outcome is to bring Kim Jung Un to his senses, not his knees. Dan G. Cox is an Associate Professor of Political Science at the School of Advanced Military Studies, Fort Leavenworth, Kansas. He has three published books, Terrorism, Instability and Democracy in Asia and Africa, Population-Centric Counterinsurgency: A False Idol (ed. ), and Stability Economics: The Economic Foundations of Security in Post-Conflict Environments (ed.). The views expressed in this article are the authors' and do not necessarily reflect the official policy or position of the the U.S. Army, the Department of Defense, or the U.S. Government. Peter Schwartz, “Your Future in 5 Easy Steps: Wired Guide to Personal Scenario Planning,” July 20, 2009, accessed 9 May 2017, https://www.wired.com/2009/07/future-5-easy-steps-wired-guide-personal-scenario-planning-step-2. Editorial Board, “The making of a refugee crisis,” Chicago Tribune, 10 September 2015, accessed 9 May 2017, http://www.chicagotribune.com/news/opinion/editorials/ct-syria-obama-putin-edit-0911-20150910-story.html. Dan Lamothe, "To counter North Korea, admiral says the U.S. should consider adding ballistic missile interceptors in Hawaii," 26 April 2017, accessed 8 May 2017, https://www.washingtonpost.com/news/checkpoint/wp/2017/04/26/to-counter-north-korea-admiral-says-the-u-s-should-consider-adding-ballistic-missile-interceptors-in-hawaii/. Tom O'Connor, "Is Kim Jong Un A Legitimate North Korea Leader? Japanese Family Ties Eyed In Half-Brother's Assassination," International Business Times, 16 February 2017, accessed 8 May 2017, http://www.ibtimes.com/kim-jong-un-legitimate-north-korea-leader-japanese-family-ties-eyed-half-brothers-2493111. Terrell Jermaine Starr, “War With North Korea Could Mean A Refugee Crisis No One Is Ready For,” Foxtrot Alpha, 21 April 2017, accessed 7 May 2017, http://foxtrotalpha.jalopnik.com/war-with-north-korea-could-mean-a-refugee-crisis-no-one-1794498603. Ted Galen Carpenter, "If China Doesn't Like THAAD, It Should Squeeze North Korea,” The National Interest, 9 August 2016, accessed 8 May 2017, http://nationalinterest.org/blog/the-skeptics/if-china-doesnt-thaad-it-should-squeeze-north-korea-17291. Editorial, “Trump, Xi end summit with 'tremendous' progress,” Aljazeera, 7 April 2017, accessed 5 May 2017, http://www.aljazeera.com/news/2017/04/trump-xi-summit-tremendous-progress-170407191146492.html. Masaru Soma, “Xi Jinping Wants to Back North Korean Leader’s Brother Kim Jong-nam?” The Liberty Web, 3 August 2016, accessed 8 May 2017, http://eng.the-liberty.com/2016/6394/. Ibid. According to inside sources, China’s leaders have a plan: to bring out Kim Jong-un’s brother Kim Jong-nam, who is currently being protected inside China, to lead North Korea if Jong-un were ever to be eliminated by a North Korean Army coup d’état. China will then support the new Kim Jong-nam administration. Editorial, "China Loses Clout With Death of Kim Jung Un Half Brother,” Honolulu Star Advertiser, 19 Feb 2017, accessed 9 May 2017, https://www.pressreader.com/usa/honolulu-star-advertiser/20170219/281698319509878. Hannah Beech, “China’s North Korean Problem,“ The New Yorker, 23February 2017, accessed 9 May 2017, http://www.newyorker.com/news/news-desk/chinas-north-korea-problem. Anna Fifield, “Twenty-five million reasons the U.S. hasn’t struck North Korea,” Washington Post, 21 April 2017, accessed 8 May 2017, https://www.washingtonpost.com/world/asia_pacific/twenty-five-million-reasons-the-us-cant-strike-north-korea/2017/04/21/47df9fea-2513-11e7-928e-3624539060e8_story.html. Christine Kim, Reuters (1 January 2013) "Korean Unification May Cost Government 7 Percent GDP."